Wolfmare is a Russian folk metal band, that comes from Wolfsangel after changing their name in 2007. Under the name Wolfsangel they released the album “Widdershins” in 2004 and now they signed to CCP to release their new album. Wolfsangel played folk black death metal, with many Celtic instruments and a fairytale atmosphere. Their debut was very interesting and I liked it very much, even though the amateur production and the bad vocals were a problem… Anyway, after many line-up changes, a new name and label they are back. Well, the change is huge! Actually the only thing that remains is the folk fairytale feeling of the album. The production is great and the technical skills are definitely improved, especially the clean vocals. The music is again Celtic folk extreme metal and except the black-death screams I’d say that the guitars have a more progressive metal approach with only a few death metal touches. The use of clean male and female vocals is very extended and both singers are very good. Acoustic instruments, violins, whistles, mandolin and bagpipes are everywhere in the songs and follow the lead melodies into a medieval setting. Unlike their debut, all traditional instruments are real and not computer samples. Many folk tunes (new and traditional ones) blend with the band’s metal sound in a very nice result. 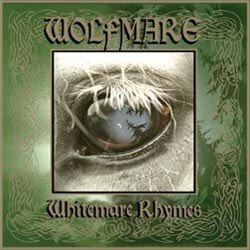 If you are into folk pagan metal, Wolfmare is a great choice. Maybe you have heard this combination of styles before, but they manage to have a personal sound. There are also guest appearances by some Cruachan musicians and the album is very professional and well played. If you prefer a more underground extreme sound though, you can check their first work “Wolfsangel – Widdershins”. Follow the links below to listen to their music.